The dream lives on, at least for Prime Minister (PM) Shinzō Abe. The 2019 Rugby World Cup will be but a taster for the Liberal Democratic Party (LDP) President, fresh from his victory in September’s party leadership contest. He has his eyes on the real political prize, which is Japan’s status as host of the 2020 Olympic Games. If Abe can stay in power that long, as now seems likely, barring any self-inflicted, corruption-related catastrophe, he will become Japan’s longest-serving Prime Minister ever. Nor is it just the Japanese electorate who seem grateful to the PM. Those investors who have Japanese exposure appear to be so, too. The Nikkei 225 has soared by 125% since Abe’s General Election victory in 2012 in local currency terms and 109% in sterling, compared to a 24% gain in the FTSE All-Share over the same period. Political stability has given the LDP a chance to put Abe’s ‘Three Arrows’ reform programme into place and tackle Japan’s deep-rooted problems of huge public debts, terrible demographics and patchy growth, with the help of the Bank of Japan’s expansive monetary policy. Abenomics also touches on employment and social reform, as well as corporate governance. Bulls of Japan argue that this cultural shift is underappreciated, with the result that the Tokyo market could still be undervalued. Questions do still remain over Bank of Japan policy and the extent to which it is distorting stock and bond markets – although this issue is one which hangs over much of the West as well, as central banks in the US and UK raise interest rates (albeit at quite different rates) and the European Central Bank moves toward a halt in its Quantitative Easing scheme. At one stage it looked as if Prime Minister (PM) Shinzō Abe’s plan to lead Japan into the 2020 Olympic Games, and become the country’s longest-serving PM ever, was in jeopardy. A long-running scandal involving the cut-price sale of school land, the PM’s wife, Akie Abe, and Finance Minister Tarō Asō had begun to chip away at the popularity of the Abe administration, just as the Liberal Democratic Party (LDP) leader was preparing to fight the triennial party leadership contest. But Abe weathered the storm caused by the so-called Moritimo Gauken affair and then cantered home in the September LDP leadership ballot. He swept aside a challenge from former Defence Minister Shigeru Ishiba, whom the PM had already defeated to win the leadership back in 2012. Last year’s General Election win and his LDP triumph, a third victory on both counts since 2012, look to clear the way to Abe’s place in history and the XXXII Summer Olympiad. Source: Asahi Shimbun, Nikkei newspaper. Dates span all periods in office which may not have been consecutive. *As of 27 November 2018. *Abe would become the longest-serving PM of all time on 19 November 2019, if still in office. But before then Abe has work to do as he looks to push ahead with his programme of social, economic and political reform. One bone of contention remains his determination to revive more of Japan’s fleet of nuclear power plants, all of which were initially shuttered after the disaster at Fukushima in 2011. The PM’s plan to rewrite Article 9 of Japan’s pacifist constitution, which outlaws war as a means to settle international disputes which involve the state, remains another political hot potato. As a result, Abe and the LDP, who still rely on their coalition partner, the New Komeitō, to form a working Government, must tread carefully, especially as they must contest two sets of elections in 2019. In April, ten governorships and over 1,000 mayoral and local assembly seats will go up for grabs in prefectural and municipal ballots. In the summer, the Japanese electorate will also get to vote on half of the House of Councillors, the Upper part of Japan’s bi-cameral Parliament, or Diet. Two global events will also take place in Japan in 2019. Osaka will host a G-20 summit in June, the first time this honour has fallen to Japan, while the Rugby World Cup will run from 20 September to 2 November, culminating in the final in Yokohama. Of greater local importance will be the planned abdication of the 85-year old Emperor Akihito on 1 May. The ascension of Crown Prince Naruhito, 58, in Golden Week will represent the first change of Emperor since 1989, and the first following an abdication since 1817. Japan’s economy had to put up with a lot in 2018, including a frigid winter, floods in July, earthquakes that struck Osaka and Hokkaido and then – to cap it all – September’s Typhoon Jebi, the worst such storm to hit the islands in 25 years. 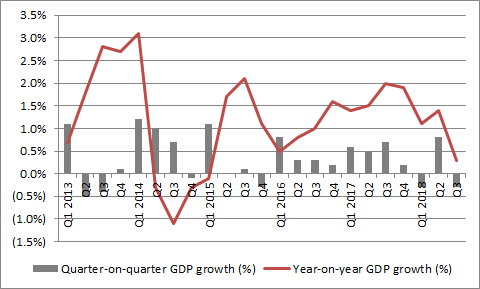 As a result, GDP fell in the first quarter of 2018, to end a run of nine straight quarters of growth. The economy seemed to bounce back adequately enough in the second quarter only to dip back in the third. The weather-related woes can be forgiven. But throw in the risk of a trade war with America, as President Trump continues with his campaign to tackle the US trade deficit, and Japan is once more in the position of having to prove that Abenomics really can help the country emerge from the debt-and-deflation doldrums which have dogged it since 1989, when a debt-fuelled stock market and property bubble finally popped. No-one can accuse the Bank of Japan (BoJ) of not trying to support Abe. Under Governor Haruhiko Kuroda the monetary authority has been running a complex policy, whereby it is buying ¥80 trillion a year of Japanese Government Bonds (JGBs), real estate investment trusts (J-REITs) and equity Exchange-Traded Funds (ETFs), while holding interest rates at -0.1% and capping the yield on the JGB at 0.1%. The goal is to drive inflation, wage growth and GDP growth. 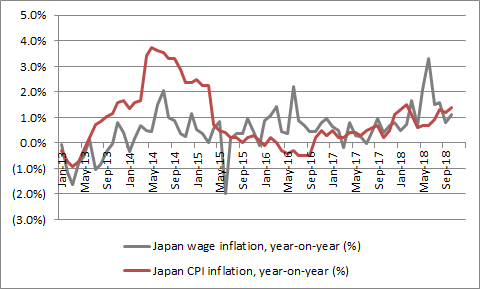 The results have been mixed so far and Kuroda, who was given a rare second, five-year term as Governor in April, has even tacitly abandoned his target of 2% inflation by April 2019. Inflation has been trending higher since mid-2016 but at an agonisingly slow pace. He was not the only one to scrub a cherished goal. Shinzō Abe scrapped plans to achieve a primary budget surplus by 2020, pushing that back to 2025, as he continued to try and mix fiscal with monetary stimulus. 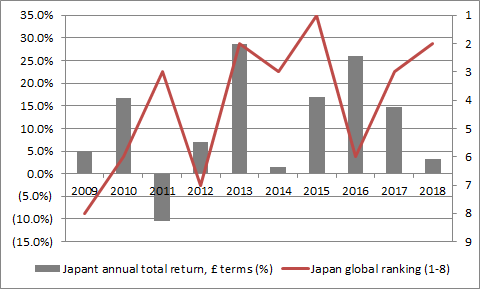 Despite such concerns, Japanese equities did relatively well in 2018, with only the US equity market providing superior total returns in sterling terms and Eastern Europe, Latin America, Western Europe, the UK, Asia and Africa and the Middle East all trailing in its wake. Source: Refinitiv data, based on Nikkei 225 index. Total returns in sterling terms, 1 January to 29 November 2018. Debt. Hampered by poor demographics, in the form of an ageing population, and the legacy of previous, failed attempts to spend its way out of trouble and into growth Japan is saddled with huge debts. Government debt to GDP is 232% of GDP according to the BoJ. That is the highest figure in the world and one that leaves the Abe administration with less ammunition than it would like. An increase in Consumption Tax from 8% to 10% is planned for October 2019, to try and put some cash in the kitty, but this has already been delayed for three years and with good reason, since 2014’s increase from 5% to 8% pushed the country into recession. Japanese markets are broken. This may seem like an extreme stance but bears will argue that Bank of Japan intervention means that Tokyo’s markets are unbalanced at best, broken at worst. Owing to the full-tilt QQE programme that has been in place since 2014, the Bank of Japan now owns nearly 50% of the Japanese Government Bond market and 80% of domestically-focused Exchanged-Traded Funds (ETFs). As a result it is a top-ten shareholder in around 40% of Japan’s 3,700 quoted companies and the BoJ’s balance sheet is nearing 100% of GDP. This is way, way higher than the 20% of GDP represented by the Federal Reserve’s assets in America and 24% by the Bank of England’s estimated assets in the UK. There are three, inter-related dangers here. One, the Bank of Japan simply runs out of monetary tricks and has to resort to helicopter money, to the detriment of the yen (and thus the value of yen-denominated assets held by UK-based advisers and clients). Two, confidence in BoJ policies ebbs and takes Tokyo’s financial markets with it. Three, the BoJ eventually stops buying, or even turns seller, leaving Japanese assets without their largest buyer and thus potentially exposed on the downside. The case for Japan has two main thrusts. Corporate reform. Encouraged by the creation of the JPX-Nikkei 400 index, which includes firms on the basis of profits and governance not size, Japanese corporates are raising their game. Research from Dealogic suggests that Japanese firms are on track to break 2009’s record for the disposal of non-core assets. Partly helped by this influx of cash, dividends and share buybacks are on the up, with buybacks running near the record levels of 2016 (¥6 trillion). Analysis from Japan Macro Advisers shows that return on equity (ROE) amongst Japanese corporates is rising as profit margins expand. ROE now exceeds the 8% goal laid out by a 2014 Government paper. Valuation. Japan’s stock market is not trading at or very near to its all-time highs, unlike say the UK or USA. 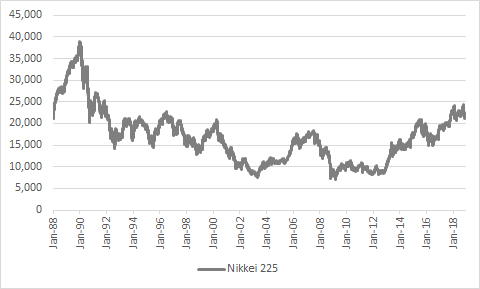 The Nikkei 225 index still trades more than 40% below the peak it reached all the way back in December 1989.